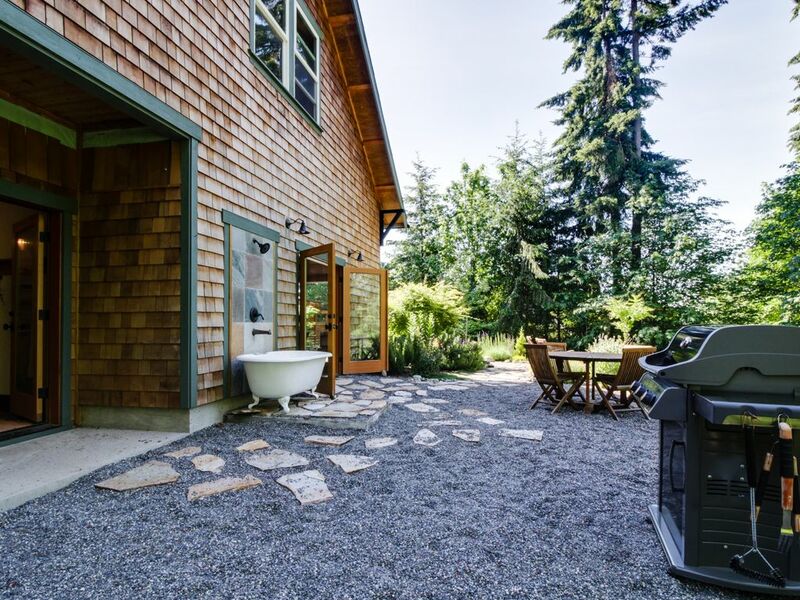 The perfect mix of natural beauty and access to modern wonders, this Bainbridge Island cottage is begging for a family or small group to visit and enjoy the sights and sounds of Bainbridge and Seattle alike. The Artist's Retreat, situated on an acre of land dotted by old-growth trees and lovely gardens, can house up to four guests. It's conveniently located at the south end of Bainbridge Island, between Fort Ward and Bainbridge town, offering you a variety of choices for how to spend your day. Take in a small-town atmosphere on the island, duck over to Seattle for a day with your friends on a ferry, or take the kids boating, biking, or scuba diving at Fort Ward Park. The living room offers a nice, cozy couch, perfect for relaxing with a good book - either your own or one from the home's private collection. The sofa is positioned by the patio doors, perfect for enjoying a nice summer breeze and admiring the trees outside. Winter visitors needn't worry, as a wood stove and fully stocked wood shed will keep everyone nice and toasty. A sturdy dining table tucked into the corner seats up to four guests at once, but more can enjoy something tasty at the elevated table in the center of the room that serves as a kitchen island. Missing only a dishwasher, the kitchen is well equipped, with all the small appliances you'll need to make something tasty, including a toaster, coffeemaker, and grinder. The two bedrooms of the Artist's Retreat are both upstairs, one with a queen, the other with a king. The master bedroom also boasts an elegant chandelier and one of the two full baths, complete with an outdoor clawfoot tub and shower nozzle for versatility. The second bedroom also has its own bath with a standalone shower, and an additional half-bath includes a washer and dryer to keep everyone's clothes nice and clean. The lovely gardens, cheerful birdsong, and gorgeous forested landscape allow for stunning views both inside and out - whether you're walking around with the kids or simply enjoying the occasional look up from whatever project you're working on indoors. The pea gravel patio also includes a gas grill and outdoor dining table that seats four for summer cookouts, perfect for coming back to after a day of exploring Bainbridge town's novelty shops or the islands many beaches. Just a few miles away is the ferry terminal, which gives access to Seattle. From simply walking the city and searching for nooks and crannies to staples like the Space Needle and Pike Place Market, there's no shortage of activities awaiting you in the Emerald City. The Artist's Retreat is a true gem, offering an amazing home with natural seclusion and easy access to urban exploration. Artists, small groups, and families alike will all find something to love in this incredible home. I had been working 65 hour weeks for the past 5 months and my wife could see I was on the brink of a Chernobyl'esque meltdown. Upon her insistence, the reactor core was exposed to a calming, 3 day dose of lazy, boozy promenades, local/seasonal cuisine, and the first proper bath I'd taken in memory. A perfect home to dip your toes into the uniquely pastoral-adjacent island culture that this ddestination embodies. All the amenities to cook a fresh, locally-sourced meal and finish up our wedding thank you cards. I spent two days here with a close friend for a staycation and the house was perfect for what we were looking for. Exceptionally clean, every amenity you could need, a well stocked kitchen and a beautiful claw foot tub! The floors upstairs are heated which added a luxurious feel to the home. Beds were comfortable, we couldn’t have asked for more! We enjoyed our stay in this peaceful, charming retreat. I love to cook and was very happy to find a well designed and fully functional kitchen, The house itself was very cozy, with comfortable beds and nice bathrooms! Loved the heated floors in the bathroom. We enjoyed the comfortable couch and a nice fire one night. The property was very quiet and not too far from town and the ferry. My husband and I would definitely come back again! Loved all the great art work! So delightful! All the appointments, furniture, art were lovely! Entry and closing up was a breeze. Some things missing- the heaters are terrible. The one by the door closest to the driveway doesn’t work at all. Plan to build a fire. It is not optional if it is cold out! Bring wood with you. It is expensive in town. The only other thing is that as a single woman, having no curtains anywhere in this all glass door house was a little unerving. I do not get nervous and I was nervous. I get what you are trying to create but good to just be aware. Otherwise it was perfect for a three day private work retreat. I will be back. With wood! We appreciate our guest leaving their feedback with us. The heater is scheduled for repair, and we have suggested curtains to the owner. Thank you! Love the decor and kitchen. Quiet place for a couple or small family. Very clean and updated. Would go back if ever in the Bainbridge area! This immaculate artists retreat was perfect for our northwest getaway. The vibe was so perfect from the garden property to the art filled walls. The beds are super comfortable and all the creature comforts are there. We will definitely return!